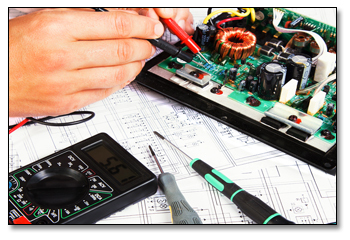 For more information about our Electronic & PCB Testing Services click here to contact us. One option an OEM may request from their contract manufacturer is electronic testing of the product produced. Receiving fully tested PCB assemblies’ increases confidence and reduces timescales in the subsequent stages of system integration, helping achieve on-time delivery to the end customer. The level and nature of electronic testing can be determined to balance complexity, style and product function. The route to cost effective testing includes the ability to provide comprehensive diagnostics such that manufacturing or component defects can be corrected in the minimum of time and least impact on the production cycle. AMS Electronics a leader in low to medium volume, high mix assembly, we can provide various levels of test to suit each client product’s individual needs. Our commitment to test is our commitment to you. Where service is at the forefront of our mission, our test procedures are the means to delivering the service every client deserves. AMS Electronics can provide functional testing which can be PC-driven or application based with our testing simulating actual-use operational modes. Or, if requested by our customer. We can design and fabricate a functional tester or our customer can provide their own test. Functional testing could require a transfer of technology between AMS and our customers, if so, AMS will work closely with the customer to coordinate this transfer. AMS Electronics also provides Cable & Harness Testing which ensures that each and every cable and wire harness is built to exacting specifications. We build to IPC620  Class 1, and 2. Optional test that AMS can perform include, pull tests, crimp-type tests, Hi-pot tests, Continuity tests, shorts and mis-wires, to name a few. AMS Electronics can additional offer box/system testing to test applications and products with a broad range of test methods and systems as well as profound test knowledge in manufacturing processes. Customers get extensive test experience for testing entire systems and also complex systems with a high number of variations.